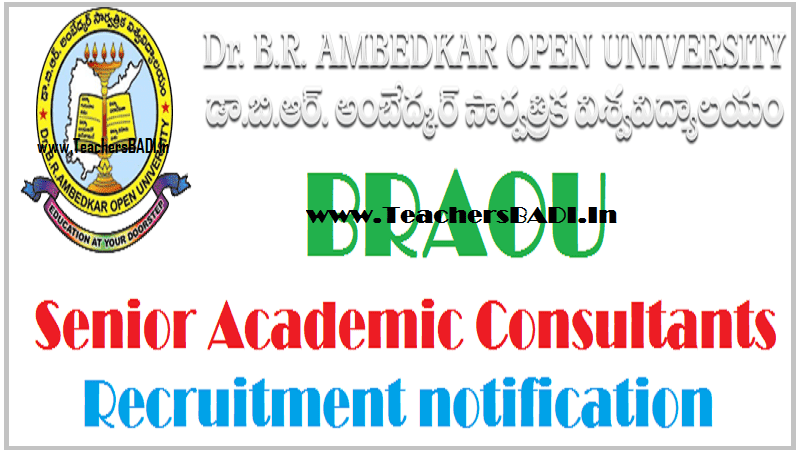 BRAOU Academic Consultants Recruitment 2017 Apply now before 13/04/2017: BRAOU Senior Academic Consultants, Senior Consultants, Academic Consultants, Consultants @ Ambedkar Open University. Dr. B.R.Ambedkar Open University has given the BRAOU Senior Academic Consultants Recruitment 2016 and invites Applications for Senior Academic Consultants in the Departments of Botany & Urdu and Senior Consultant A/V (Programme Production) in the Audio Visual Production & Research Centre (AVPRC) and Academic Consultants in the Departments of Botany, Physics, Zoology, Hindi, Library & Information Science, Education (Physical Sciences) & Special Education (Hearing Impaired) and consultant A/V (Production & Co-ordination) in the AVPRC on contract basis. Dr. BR Ambedkar Open University has published the Academic Consultants recruitment notification and invites applications for Academic Consultants on contract basis. Must be a Retired University/ College teacher with Ph.D./ M.Phil or an eminent person in the relevant field with Ph.D./ M.Phil. Or Must possess Ph.D./ M.Phil./ NET/ SLET in the subject concerned and a minimum of 55% marks at P.G. level with good academic record. Candidates may submit their applications along with the copies of the certificates of Educational qualifications, experience to the Director, CIQA & UGC-DEB Affairs, Dr. B.R .Ambedkar Open University, Road No.46, Jubilee Hills, Hyderabad either by post or in person on or before 13.04.2017. Remuneration: The fixed remuneration of Rs. 30,000 for Senior Consultants and Rs.25,000 for Consultants is payable per month. These positions are purely temporary and may be terminated at any time without assigning any reasons. 2. Qualifications for Academic Consultants: (Botany, Physics, Zoology, Hindi,Library & Information Science, Education (Physical Sciences), Education (Special Education-Hearing Impaired). ~ Must possess Ph.D/M.Phil/NET/SLET in the subject concerned and a minimum of 55% of marks at P.G. Level with good academic record. Essential Qualifications: Masters Degree in Arts, Commerce, Science, Social Sciences. 2. 10 years of Experience in any Educational media organization in a senior capacity such as Producer/Dy. Director. 3. Knowledge of contractual formalities/Agreements regarding Transmission of programmes through Public service Broadcast organizations such as All India Radio, Doordarshan etc. * Production of Educational Audio, Video lessons of broadcast quality for transmission through Electronic media channels. *Working experience of a Producer who can handle a variety of programme production formats. *Writing of Production scripts for providing creative treatment of the Academic scripts provided by the Faculty Members. *Sitting on the Video Switcher and giving commands to the production/technical crew during online, offline recordings including live teleconference programmes. Any graduate with two years experience in production of Audio Visual Programmes / Episodes, Coordination of the work related to the programme support services like graphics, scenic, design etc. and in live streaming through Internet (both one way communication and two way communication). Selection Process: The selection will be made on the basis of Interview. The interested candidates may submit their applications along with the copies of the certificates of Educational Qualifications, Experience, Date of Birth, Social Status, Adhar Card, Photo-ID and Address proof to the Development Officer, Development Cell, Dr. B.R.Ambedkar Open University, Road No. 46, Jubilee Hills, Hyderabad-500033 either by post or in person on or before 10-11-2016. Newedge is overseas education consultants Hyderabad. Scholarship guidance and visa assistance, admission guidance, finance assistance. Overseas Education in Canada We provide extensive training for IELTS, PTE, TOEFL and GRE with trained tutors.